The windscreen on the FJR1300 normally auto-retracts to the lowest position when the ignition is turned off. Some folks would prefer that it remain in whatever position it was, so that it will already be positioned the way they want the next time they ride their bike. This page shows a simple trick to make that behavior the default. First, you must remove panels "D" and "C". 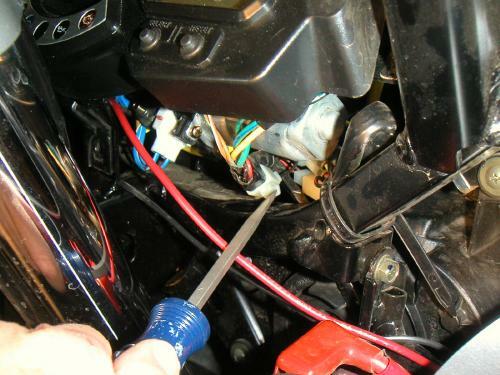 Refer to the Dash Panel page for directions on how to do this. 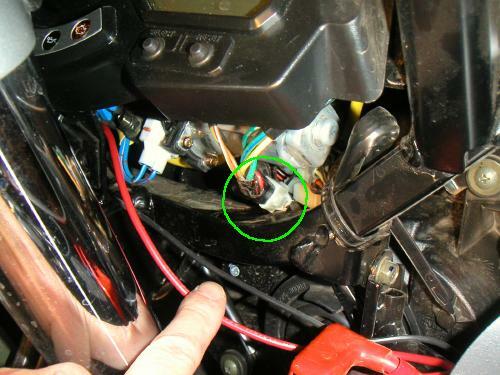 Find the small white connector shown in the photo above with the green circle around it. It doesn't have much slack in the wires, and is a bit hard to reach. The fat red wire I'm holding down with my finger, and the black wire just above it, go to my Heat-Troller, and aren't stock wires. To disconnect it, there is a spring-like piece of plastic on one side which must be squeezed in towards the body of the connector. The photo above shows how I used a screwdriver blade to accomplish this. It takes some patience, as there isn't much room for your fingers in there. 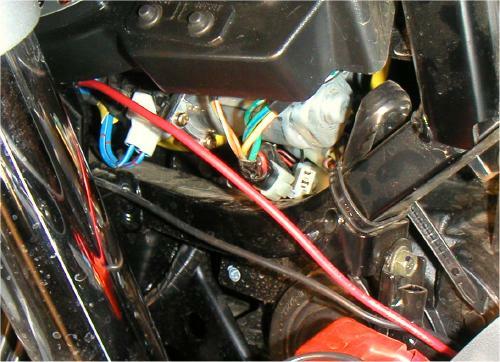 With the connector disconnected as shown in the photo above, the windscreen will remain in position when the ignition is turned off. The rocker switch to raise and lower it will still work.